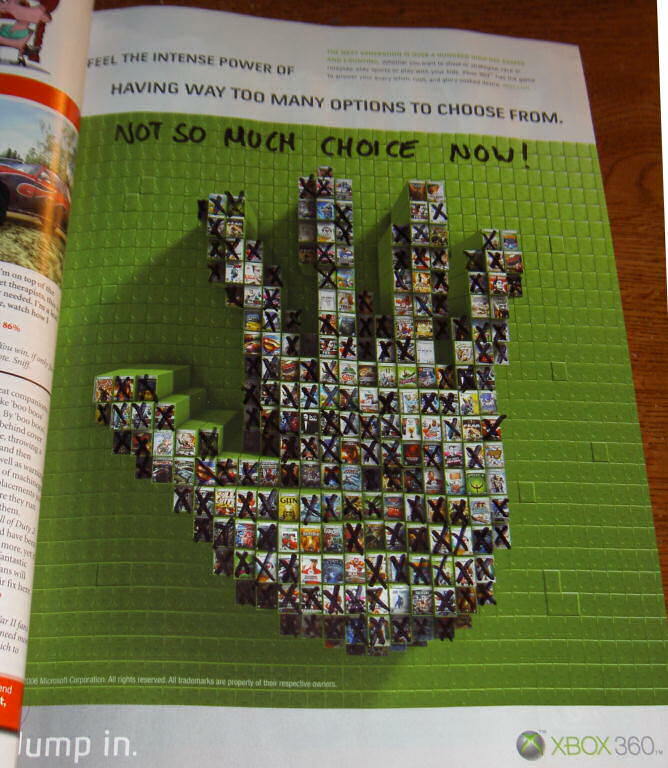 I really enjoy my Xbox 360 – surprising considering I held the opinion my Xbox 1 was an ugly waste of space and that my PlayStation 2 satisfied my needs. Microsoft have done many things right with this machine (Online, XNA, dashboard, media center, high-def). Sure, the hard disk should have been bigger especially now they are selling movies but my real complaint is that there STILL aren’t enough titles I want to play on it. 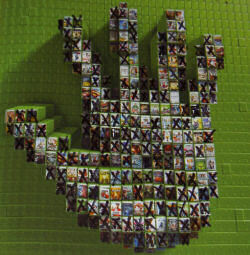 Followed by a giant hand-print of hundreds of games. Wow, I must have missed something. There must be lots of games just waiting for me! A quick scan through revealed a lot of dull EA Sports licenses (FIFA, NHL, Madden, NBA blah blah blah) and a lot of duplicated titles. A thought struck me – If I crossed out all the duplicate images what would we have left? Something a little closer to reality. Click the image to zoom. 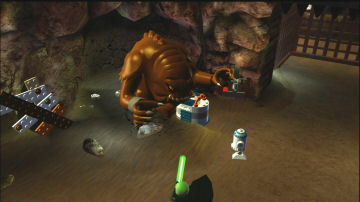 I enjoyed the original LEGO Star Wars back on the PlayStation 2 some time ago. The co-operative play element, the LEGO world combined with the Star Wars world (obviously) and a healthy dose of comedy slapstick that surprised me giving LucasArt’s strict control of the Star Wars universe. But then they let Spaced burn a pile of Star Wars merchandise to official music so maybe they’re not all humorless droids. The original game covered Episodes I-III and so when Steve reminded me LEGO Star Wars II was coming out and would be covering Episodes IV-VI (A New Hope, Empire Strikes Back and Return of the Jedi) I knew I had to have it. The only question was which format and in the end I bit the bullet and went with the 360 version at £29.99 – a whopping 50% more than the PC version. Thanks Microsoft. I’ve only played through A New Hope so far but all your favorite moments are there albeit with LEGO’s new take on everything such as the Storm Trooper helmet machines and picking up Death Star crew with a crane and dropping them in a hole for bonuses. There are some additions over the original too. As well as blowing almost everything in sight up you can now find piles of blocks to assemble into bridges, parts of robots etc. as well as creatures, Luke’s speeder and AT-ST’s to ride around. There are also new dark-force glowing objects to interact with reminding you to come back and play the levels again to unlock all the mini-kit pieces you need to build your own virtual garage of craft from the universe. If I have one complaint it’s pretty much the one I have in all 3D games… the camera angle. Often it goes off all over the place and some parts such as controlling the AT-ST is pure infuriating in two player as the camera attempts to follow one of you and slides the other person/their ride around uncontrollably before trapping them in a corner. I’d much rather have seen a split-screen mode or a camera that wasn’t afraid to zoom out more. Perhaps on LEGO Star Wars III… oh, there’s no more Star Wars left to cast into plastic! I guess the their trilogy stops here.